Nowadays longboarding is a thrilling passion to the younger generation. You can ride across the streets, markets, campus, corridors with longboards. But at the starting it is not so easy to ride them. It needs passion, patience and practice to be a skillful longboarder. Also, it is quite confusing to choose the best longboard for beginners. That’s why it is a very important matter to deal with at the beginning of longboarding. Don’t worry, I know you can achieve it as you are passionate and going to do regular practice. Also you should keep in mind that safety is a major issue during longboarding. To make it a success you should look after your safety gears as well as your longboard selection. At this point we are happy to help you by presenting the top to bottom through analysis of the best longboards. You can choose your awesome longboard which is most suitable for you from below. The atom drop-through longboard is a great choice for the beginners to start up with. It’s drop-down feature gives low centre of gravity which makes the board stable, durable and comfortable. The deck is made up with maple wood ply. 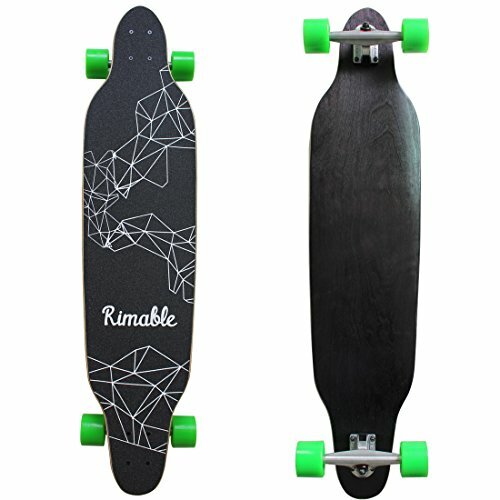 The size of the board(41.7x10.6 inches) is perfectly suitable for good and safe longboarding. Atom drop-through longboard has the 245mm axle along with reverse kingpin configuration, which gives it more comfort during turning. After all, the unique design of the board makes the board more controllable at a higher speed. The detailed key feature is given below. 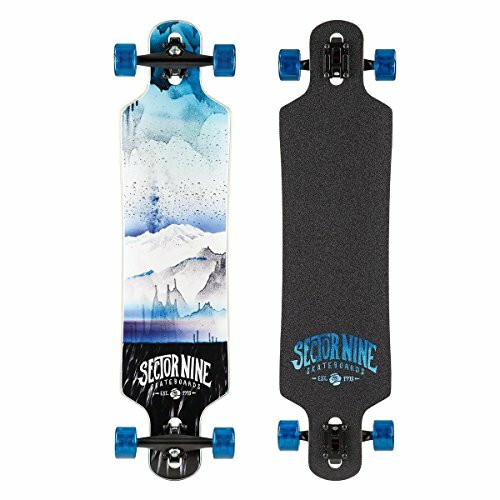 The maple finished flexible deck, longer axle with RKP, SHR polyurethane wheel, 80S grip tape and the drop through feature makes the board super awesome for downhill carving, cruising, freeriding. 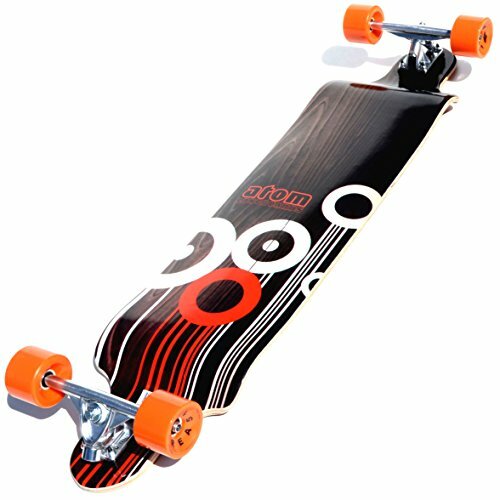 However, affordability, Stability makes the atom drop-through longboard is the best choice for longboarding. 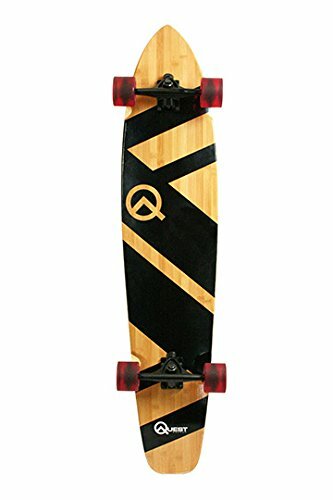 The 44 inches long Super cruiser Artisan Longboard made by Quest is a very much popular board. Most of all, it has a great numbers of satisfied customers worldwide. Multi ply hardwood maple and artisan bamboo deck ensures great quality and good flexibility. And the board is furnished with rugged 7 inches inverted trucks and 70mm PU wheel, which gives it a long durability as well as stability. The large deck is very much suitable for the beginners as well as skilled longboarders. 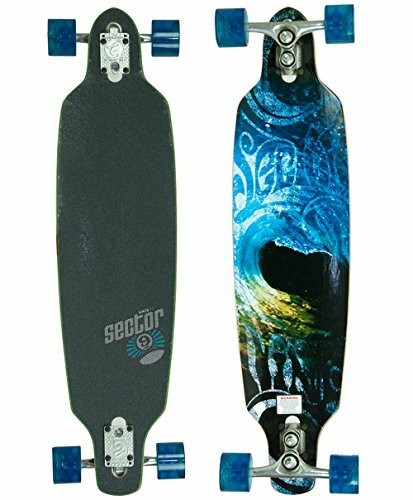 However, its color and eye catching abstract design makes the board an eye candy and shows your personality during longboarding. Finally, the specious board gives the beginners an extra layer of security. Great design, good making and the great stability makes the board is a must have to every longboarders. In addition, you can experience a great cruising, tricking and feels amazing when riding on the top of the board. Therefore, beginners as well as professionals can choose the board blindly. Finally,this board is a wise choice for the longboarders. If you are going to start your longboarding adventure, then Atom pintail Longboard is a good board to start up. Moreover, it is a great board for cruising. The board has classic pintail shape which gives you the comfort and stability of riding . Furthermore, pintail shape prevents the wheel bite. The different color of the board gives you an opportunity to choose the right one according to you personality. This board gives you a classic cruising experience at an affordable price. You will love it as your first longboard. Atom pintail longboard is the simple yet powerful longboard for the beginners. It is simply the best choice to go with an affordable price tag. Do you want a complete longboard? Do you want to enjoy your ride? Then Sector 9 aperture sidewinder drop through downhill longboard is the best choice for you. This board is a total beast. You can use it for downhill carving, cruising, free riding and slalom. The drop through deck gives it a super stability. You can enjoy your riding throughout the city, in the campus, corridor or along the road in a thrilling, charming, amazing new way. If you use it, then you can discover new ways of playing with it. The Sector 9 aperture sidewinder drop through downhill longboard is an all-rounder in its group. If you want to learn, do some tricks, the board is ready to perform it in your way. Make this longboard your friend, surely you will be a good longboard rider. The yocaher is delivering innovative highly sustainable longboards since 1997. And, Yocaher professional speed drop down stained complete Longboard is one of the most reliable product from them. This board is completely awesome and popular to the very much professionals as well as to a newbie rider. Enormous range of colors to choose, and it will flourish your personality in front of public. This board has a unique concave deck makes it down to earth and highly stable. The board is equipped with the chrome bearings and wrapped with black widow premium grade 80A black grip tape. It will help to create sufficient traction to go for high speed downhill riding or cruising. The board comes with fully assembled parts. As a result you can ride it just after unboxing. The board has tail and nose cut which prevent you to get rid of wheel bite. Keep a look at it’s features. The Yocaher professional speed drop down stained complete Longboard is an unique board with versatile features. The board is loved by not only the professionals, but also the beginners can try it for it’s large safety range design. The Sector 9 Meridian is a complete longboard. This longboard is assembled with 10 inch charger trucks made from Gullwing. The 70mm 78A center set and the TS wheels give a smooth longboarding as well. Additionally, the 5 grease ball bearings help to do so. This longboard also has awesome ERG grip tape and the flush mount steel bolts. The dimension of the longboard is 40x9.75x30.5 inches (LxWxH). The longboard is made of 8 ply Maple, Taco mold and drop through mount. The longboard is perfect for both commuter and free style riding. Basically, this one is a great longboard. Anybody can use it easily, the 45.5 inches is too easy to control the momentum. This longboard is suitable for both professional and newbie longboard rider. 5 ggreaseball bearings offer smooth riding. As we mentioned above, this longboard is perfect for all type of people. People usually find it very user friendly and easier operation. So, you can buy this longboard without any confusion. 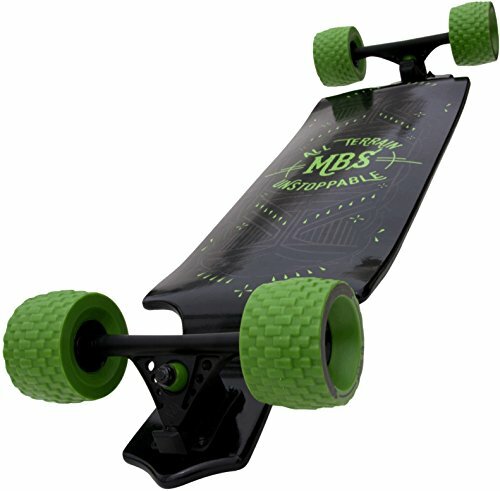 The MBS All-Terrain is simply a great and perfect longboard for both professional and newbie. This is a 100mm X 65mm longboard so it lets you to maintain your center of Gravity and offers a perfect balance between the speed and the traction. Additionally, this longboard has a 10 ply maple lam drop deck which has made the longboard sturdy. And the unit comes in completely assembled so you are able to use it just after buying. The 190mm navigator drone makes the turning easier. This will let you take challenges! The 9 ABEC rubber shielded bearings give the rider more perfect riding. You are also able to ride the longboard in different styles such as commuter, free style or off road riding. This one will let you as where you want to go and how you need the board. 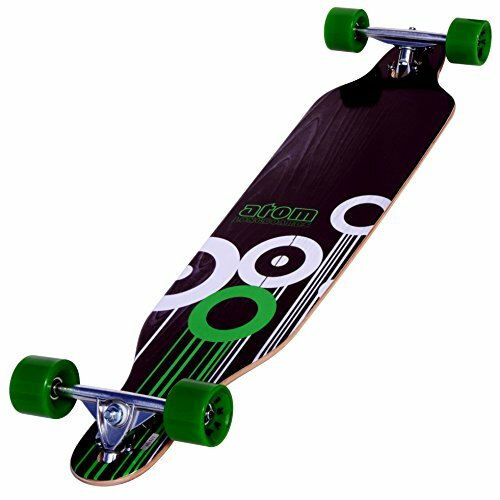 The Atom Drop longboard is a 41 inches longboard which ensures you better control over center of gravity and momentum. The longboard is covered with full maple deck which one has made the board sturdy. The 9 ABEC ball bearing is too good for better cornering performance. The 245 mm axles and 70 by 51 mm wide lip for more perfect operation. Additionally, the board has 80S grip tape for better griping. This ultra low riding board has ease of pushing to take wear and the tear out of the whole town around. Besides, the unique perimeter shape offers 9.6 inches of leverage for every turn even while eliminating the wheel bite. This board is very popular for its drop style riding capability. This one will give you an extreme feeling. You may use this to wherever you want and this is able to be your best company. This is a 41 inch longboard so you have better momentum control and center of gravity control. You will love the longboard, trust me! The longboard is 41 inches by 9.5 inches so you have a bigger deck which helps for better control while riding. The 70 by 51 mm wheels are great for easier cornering as like as other premium skateboards. This is mainly a low profile longboard but it has 11 ABEC bearing and they are of high speed. The board is fully coated by 9 ply of maple deck. Additionally, this strong board is able to take more loads. This is a great choice for them who are heavier than general weight people. That’s why this board is very popular to the heavy people. Actually, this is a low cost longboard, but this is able to serve as your high budget boards do. There is no doubt that, this will be one of your perfect choices. Additionally, there are many available colors. You can choose from a huge collection. 70 by 51 mm wheels. The drop through long board is just awesome. The board is able to more load so you can also enjoy the longboarding if you’re heavy in weight too. This all rounder longboard is a great choice for downhilling because of its ease of pushing. As like as our previous chosen mode, this one has almost same specification. That’s because they are from the same manufacturer names Rimble. 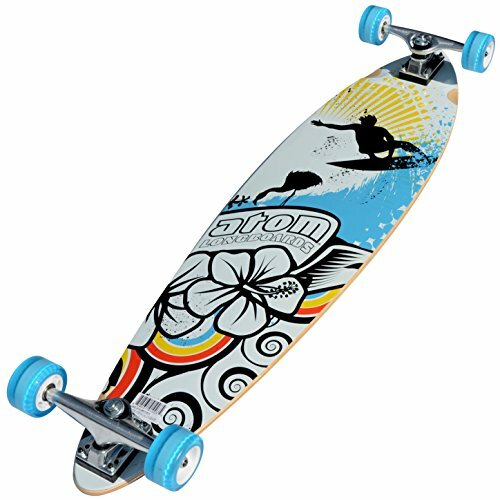 As like as that model, the longboard is 42 inches by 9.5 inches so you have a bigger deck which helps for better control while riding. The 70 by 51 mm wheels are great for easier cornering as like as other premium skateboards. This is mainly a low profile longboard but it has 11 ABEC bearing and they are of high speed. Also, there are too much different colors available for this board. You can pick any of them according to your choice. Though, the price of the board is lower than other premium boards, but this board is made to give you a premium feeling. You surely can go for this board in your low budget. 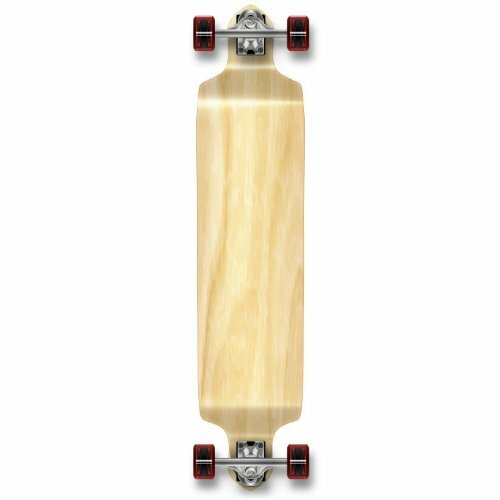 This is an awesome longboard in the low price range. There is no major issue with this low cost longboard. 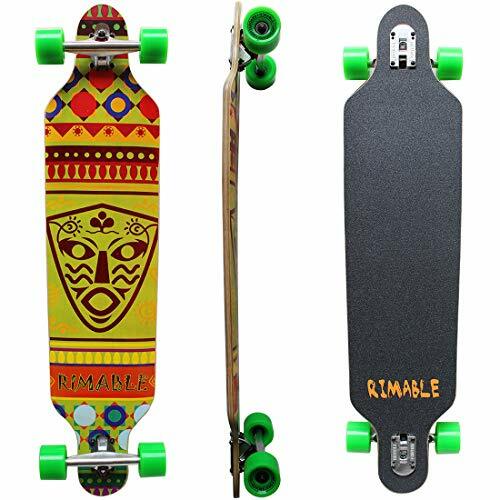 Though it is a cheap longboard, but it will able to satisfy you and present you a great longboard riding feeling. Above all the detailed features of the top five longboards you can pick any one for you. All the boards are designed with great safety for the beginners. Because, safety is the major issue during learning the longboarding techniques. Don’t get confused, we have well researched for you to pick the best board. At the beginning just put on the safety gears for added safety. If you have any problem just contact us, our team will guide you. 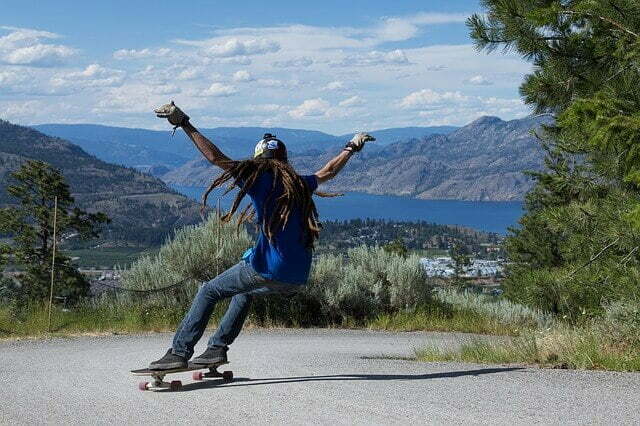 Start your longboarding as soon as possible, you will see a new adventurous way of living which you never felt before. Thank you for reaching this far. Happy Longboarding. I have decided to learn skateboarding now, at the age of 30. I think I am not too late to start. I can take all the safety before riding to avoid major injuries. I have skateboard shoes, I have purchased it previously. Now I am looking for the best skateboard for me. Here I have got a list of good skateboards. Thanks for sharing. I can make the easy choice.